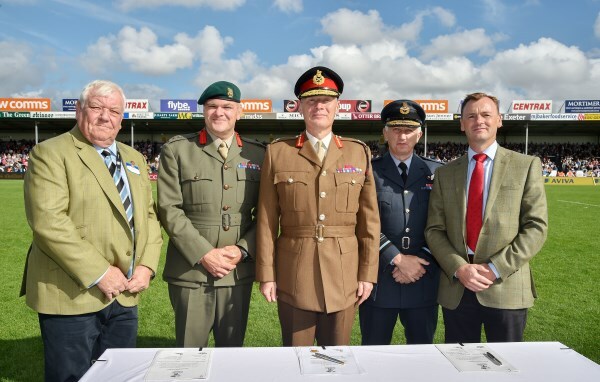 Leading national housebuilder Bovis Homes has strengthened its links with the UK military in a special event in conjunction with Exeter Rugby on Sunday. The Bovis Homes Armed Forces Day event, held at Exeter Rugby Club's Sandy Park stadium, was arranged to celebrate Bovis Homes' and Exeter Chiefs' signing of the Armed Forces Covenant during the half-time interval of their Premiership match with Saracens. The event was also attended by senior military personnel including Lieutenant General Sir John Lorimer, President of the Army Rugby Union, and representatives of the Invictus foundation. The Armed Forces Covenant is a promise from the nation that those who serve or have served, and their families, are treated fairly when accessing both public sector and private services. Businesses, local authorities and charities are all being encouraged to sign the covenant. As part of its commitment to the covenant, Bovis Homes will continue to help ex-servicemen and women to find new roles in the company through the Career Transition Partnership (CTP), as well as supporting staff members who choose to be members of the Reserve forces. A new unique discount scheme is also being rolled out. The Bovis Homes Armed Forces discount scheme, which was also launched at the event, will be open to serving forces personnel (regular and reservists), including those based across the South West. It allows service personnel to combine buyer assistance schemes with a package of offers from the company, in order to purchase their own Bovis home as simply and affordably as possible. David Ritchie, Chief Executive of Bovis Homes, said: "Bovis Homes is delighted to have signed the Armed Forces Covenant, reinforcing our long history of support for UK service personnel past and present. We look forward to working closely with the Ministry of Defence going forward and finding new ways to support the unique needs of the serving members of the Armed Forces and their families. "We hope that through initiatives like our military discount scheme, we can help our Forces personnel to find their perfect home with ease and affordability so that they can focus on continuing their enormous contribution to our country." Lieutenant General Sir John Lorimer commented: "Bovis Homes has today joined the ever-growing list of organisations who have signed the Armed Forces Covenant. As one of the UK's major house builders we are delighted that they have pledged to offer such significant discounts to Armed Forces Personnel, in conjunction with the Government's Help to Buy and Forces Help to Buy schemes."